By W. Roger Cox, P.E. Manager, Hillsborough County Florida and Jeff Thurman, C.P.M., Consultant, LA Consulting Inc. Creating long-term efficiencies and sustainability is a huge focus of today’s government sector. Every day the charge of Public Works’ leaders is to do more, with less. Further, technology, if used correctly, can be an effective tool for organizing work and cutting costs. In late 2010 and continuing into 2014, Hillsborough County, Florida embarked on a two-phase process of cultural change and process improvement. The goals were to establish a baseline of current operations, develop and identify opportunities that would improve operations and formulate recommendations that would lead to improvements and implementation strategies to ultimately enhance work methods and management efforts. The review was not an audit but an internal effort to improve, consistent with their mission statement and guiding principles. The initial phase was a top to bottom review to determine the most effective and efficient way to deliver high-quality responsive service. While the review revealed that the County was performing at a high level in many areas, there were several opportunities identified for improvement. Hillsborough County, Florida is located on the west coast of Florida, southwest of Orlando. The County has 1,051 square miles of land and an additional 215 square miles of water. With approximately 158 miles of shoreline on Tampa Bay, the County’s coast makes it the largest bay in Florida, which also opens to the Gulf of Mexico. The population has seen consistent growth and is expected to grow by 1.58 million in 2030. The County draws over 15 million tourists annually, increasing the County’s traffic and infrastructure use and placing an extra emphasis on repair and maintenance. The Transportation Maintenance Division (TMD) maintains a roadway network of considerable size and associated assets, including over 3,300 centerline miles of roadway. The lane miles could, for instance, cover the approximate distance from Tampa to Bellingham, Washington and back! The road miles are the state’s third largest and Hillsborough has more road miles than Hawaii, Road Island, New Jersey, Vermont and Massachusetts DOTs combined. In addition to the pavement features, the Division is also responsible for maintaining approximately 2,500 miles of sidewalks, 119,000 sidewalk ramps, 3,000 miles of curb, 3,500 miles of shoulder, 1,200 miles of culverts, 1,200 miles of ditches, 7,000 stormwater manholes and junction boxes, 2,400 control structures, 72,000 end treatments, 14,000 headwalls and 2,200 detention/retention ponds. They also have responsibility for the maintenance of 251 bridges. The County has a total asset value of over $10 billion. The path of evaluation was to follow the four phases of ideal maintenance management, including planning, organizing, scheduling and controlling. The result of the evaluations was a complete outline of their current state or baseline, the identification of 86 opportunities for improvement, and 68 key recommendations that comprised of all four phases of the ideal maintenance management agency. The review’s final report served as a game plan to achieve the goals of an efficient and effective organization. After the evaluation and development of the game plan, it was time to implement its recommendations, charting a path to improvement. Initially, Hillsborough County had to re-establish and define the maintenance and repair activities they perform and determine which assets they were responsible for. This first step used a combination of the institutional knowledge of employees, GIS technology, and other manual and automated databases. 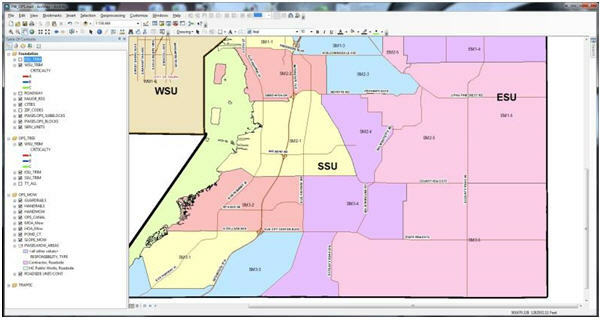 They utilized GIS and its capabilities to initially create maps of assets, boundaries and other features. From these maps, managers, supervisors and field staff reviewed them for accuracy and completeness. They used technology as a tool to assist in this process but used the knowledge of staff to assist (not direct) the effort. The final report of the review process, also included as a recommendation, the creation of an overall planning section designated to work with all of the field units, and the acquisition of a new computerized management maintenance system (CMMS) to replace the existing system. The purpose of the planning section was to provide guidance, oversight and accountability for the work performed by the County’s field units. This ensured that the work outlined as part of the department’s annual plan was fully transparent to the crews and management at the field units, as well as providing user support and data integrity and process checks. The new CMMS outlined in the review process was selected by the County to be able to be integrated with the GIS allowing for spatial data and relationships to be fully understood and used to create viable maintenance plans. Further, using technology as a tool for improving the planning, organizing and scheduling of work, the Division utilized a combination of technology and manual processes to develop maintenance routines to address the goal of planning at least 80 percent of their work and concentrating on the “significant few” that have the largest impact on their organization. From their initial effort of defining their activities with resource needs, levels of effort and knowing what they are responsible for, they were able to develop routines for the majority of their work activities. They now know the what, how, where and when of their maintenance work. For example, with the activities of right-of-way mowing, tree trimming, sidewalk repair, and ditch cleaning they utilized GIS to establish routines and create operational blocks for efficient execution by maintenance resources. The top activities were mapped and scoped to quantify their efforts. Most operational blocks were based on the amount of work that can be produced in a two week time period, which correlates to the time period established for the short term scheduling process that has been established. With known quantities and established average daily productions, they are able to calculate productions and levels of service for each activity. Through this, the Division is able to measure the effectiveness of field crews and create accountability. For mowing, operational blocks were established that have the acreage to be mowed in a specific time period. For tree trimming they have operational blocks with specific linear feet of trees to be trimmed. Figure 1-1 illustrates the developed operational blocks for right-of-way mowing. For canals they measure the linear feet of canals to be cleaned. The Division has also developed operational blocks for hand, slope and canal mowing. As a result of the establishment of operational blocks and routines for several of their maintenance activities, levels of service have increased by doing more work within the same or less resources. For example, right-of-way mowing cycles have increased over 48 percent with some units doubling their turns as compared to before the implementation of the operational blocks. They have also developed a routine for canal cleaning which will allow their canal system to be maintained on five year cycles; where before there were portions of the system that had no maintenance recorded since maintenance records have been kept. Other technologies were also established and are currently being utilized to accomplish recommendations from the game plan and achieve their goals. For example, as the result of the Service Unit’s maintenance yards being geographically too far apart to meet bi-weekly, remote web-based meeting technology like “GoToMeeting” is now being utilized to review previous bi-weekly schedules, complete audit work, establish work schedules and increase communication and cooperation between groups. As a result, the Service Units can present schedules, check with field operations for final adjustments to schedules and work, as well as monitor overall progress. Units can coordinate equipment needs and potentially insert work into the schedule. Long term projects can also be discussed, which has led to transparency and has given all employees a feeling of ownership and involvement in the operations. Meetings can also be recorded for playback by absent staff members or can be used for accountability. The result of these efforts have increased service to the public, reduced complaints, and reduced work backlog, as well as saved over a million dollars through improved efficiencies and improved business processes using less resources. Through implementation of specific recommendations, systems and processes were put into place to allow for accountability and the monitoring of resources compared to established standards. To date, the TMD has realized an approximate efficiency increase resulting in 15% productivity through the development and re-engineering of processes related to planning, organizing, and controlling the way they do business -- which means 15% more work with same resources being used. Future presentations to the Board of Hillsborough County Commissioners related to budgetary and service level changes can now be better addressed due to improved planning and organizing capabilities. Further, through this process and the leadership of Systems Planning, they have shown how they can entrust Hillsborough County to manage their limited resources and protect the public’s investment in public infrastructure. The Division identified, and now focuses on, their primary activities by using the Pareto’s Law concept, where 20% of their activities accounted for 80% of the budget. This resulted in the vegetative control activities of tree trimming, roadside mowing and ditch cleaning being the largest work effort or restated the “green, growing, or flowing” activities which control the budget and work. The emphasis is to work on the activities that make the most impact and to resist working on activities that add little value. As an example, Hillsborough County developed and implemented several tasks into routine maintenance cycles; each based on several factors including assets that they are responsible for, available resources, and the levels of service they have determined for each activity. While applying this methodology to one of their highest requested activities, they developed and implemented mowing blocks. As a result, mowing cycles have increased overall by 25% system-wide, with some units doubling their mowing frequencies. Tree trimming and removals are another area of considerable success. After the identification of 100% of their needs, routines were developed and resources were deployed. TMD is projected to complete a tree trimming cycle every three (3) years thus increasing safety for the community and reducing the need for customers to call for requested service. With the development and execution of further routines in other activities, it is projected that TMD will realize similar efficiencies in service delivery to the customers of Hillsborough County. Through better planning, organizing, scheduling, and controlling processes and methods, they have reduced their backlog work orders by 57% and projected to reduce by an additional 30% in the near future, reducing customer requests significantly. This includes eliminating all tree trimming requests in the County. For this type of review to be successful, elements of success are required. Buy-in to the process must occur on all levels prior to commencement. Senior management has to be committed to the entire process and must see it through every step. The right person must be chosen to lead the implementation of recommendations; ideally, an employee who is and can be committed to the entire process from start to finish. Besides senior management’s commitment, communication must occur at all levels and phases to obtain optimal results. Real data must be used and confirmed so that outcomes are accurate and quantifiable. The anticipated future results include that feedback to all levels of the organization will be provided and evaluated. Future developed processes and the implementation of new technologies must match the organization’s identified needs, further contributing to the goal of continuous improvement. All work will be systemized so that there will be increased quantifiable efficiency. Lastly, employees will feel involved and empowered resulting in a feeling of transparency, ownership, pride, and job satisfaction. The game plan was about establishing business processes for overall improvement. Hillsborough County reduced their budget, increased service, and lowered backlog by developing a plan. Second to developing a plan is the critical element of employee participation, ownership, and support for making improvements to the system. The success of this review has been documented in the observations of others in a performance audit that was conducted in December 2012 by an outside, independent auditing firm. Hillsborough County’s Public Works and TMD established and implemented a clear vision that focused on both effectiveness and efficiency. As a result of the desire to continually improve operations, increase service, and reduce costs, Hillsborough County is becoming a national leader in public works efficiency, cost effectiveness and customer service.